Available now from Anri Instruments & Controls , the Madur GA-60 portable flue gas analyser uses electrochemical and IR gas sensors to measure gas concentrations and temperatures. 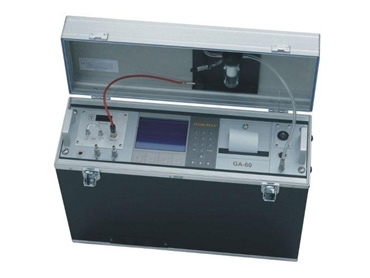 A high quality instrument produced using state of the art technologies, the GA-60 portable flue gas analyser not only has exceptional measurement abilities, it is also handy and easy to use. These instruments are fitted with five electrochemical sensors as standard, with the ability to have a further two electrochemical sensors and three infrared sensors added. Thanks to a modular construction, the Madur GA-60 portable flue gas analyser can be configured for nearly every customer requirement. It also features various analog inputs and outputs to enable easy data transfer and documentation. integral clock/calendar with separate buffer battery.